Four Metallic named WRCA World Championship Top Horse. The Metallic Cat stallion Four Metallic was honored as the Top Horse at the 2016 Working Ranch Cowboys Association World Championship Ranch Rodeo, which concluded November 13 in Amarillo. The 5-year-old red roan Ranching Heritage-bred stallion was ridden by Tripp Townsend of Earth, Texas, as they competed on the Sandhill Cattle Co. team. There were 22 teams that competed at this year’s event. The Sandhill Cattle Co. cowboys are three-time champions in the event’s history, and were this year the reserve champion team. This is only the second time Four Metallic has been shown, and the first ranch rodeo. “He’s just been a fun horse,” Townsend said. “This is his first rodeo, ever. I never got to take him to a practice rodeo. I’ve been wanting to ride him in one, and this is the only one I’ve been to since I got him back. I was very proud of him; he took it all very good. The horse’s strength, Townsend said, comes from a good mind and general talent. Four Metallic was bred by Ranching Heritage Breeder and Zoetis Best Remuda winner Haythorn Land and Cattle Co. of Arthur, Nebraska. He is owned by H&T Horses. His sire, Metallic Cat, is an 11-year-old son of High Brow Cat. 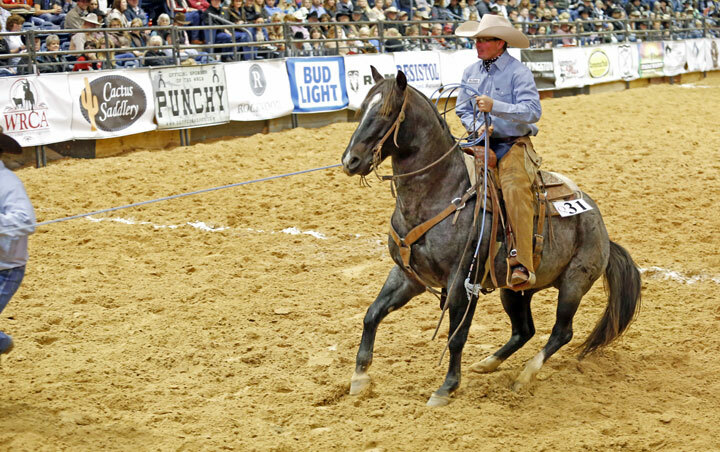 From seven registered crops, Metallic Cat has sired two AQHA world champions and progeny earnings in excess of $10.1 million in events including National Cutting Horse, National Reined Cow Horse and Stock Horse of Texas competition. This is his first Top Horse-winning progeny. Dam Raspberry Slush is a 1990 daughter of Eddie Eighty out of the Happy Hancock mare Hancock Cinco. “That old mare was one of the last daughters of Eddie Eighty, and she’d been a super mare,” Craig Haythorn said of selecting her for the cross, noting that she had consistently produced both quality riding geldings and breeding stock, including sires Slush Wood (by Drifts Chip) and Four Gray Gun (by PG Shogun). “He was always a little smaller than I thought he would be,” Haythorn said of Four Metallic. “The mare wasn’t a big mare, but Eddie Eighty was a big horse, and they bred bigger. But we always liked him. Everything about him. This is the fifth WCRR Top Horse award Haythorn’s horses have won, although it is the first time the honor was earned with someone other than Haythorn aboard. Four Metallic is scheduled to compete at the Ranch Horse Association of America Finals in Abilene next spring before heading back to the ranch to continue his work as a ranch sire. The Reserve Top Horse was Shining Miki Sioux, a 2007 brown mare by Zans Diamond Shine and out of Miki Blue Eyes by Colonel Gaddis. She was ridden by Toby Snyder and owned by Snyder Ranch of Coldwater, Kansas. They competed for the Snyder Ranch & Woolfolk Ranch team; “Diamond” and Snyder won the top horse award at the Meade Co. Fair and Rodeo, where their team got qualified.